When it comes to CRM, it is undeniably all about the most important aspect of your business - your Customers. And that is why, have brought together the power of sales and subscription billing. So, you can close your deals much faster, and collaborate seamlessly with existing as well as prospective customers. With the Chargebee and Salesforce integration, we have ensured that the baton is passed on to the sales team with readily available information such as subscription status and invoice details inside Salesforce. You can build contextual conversations with this. 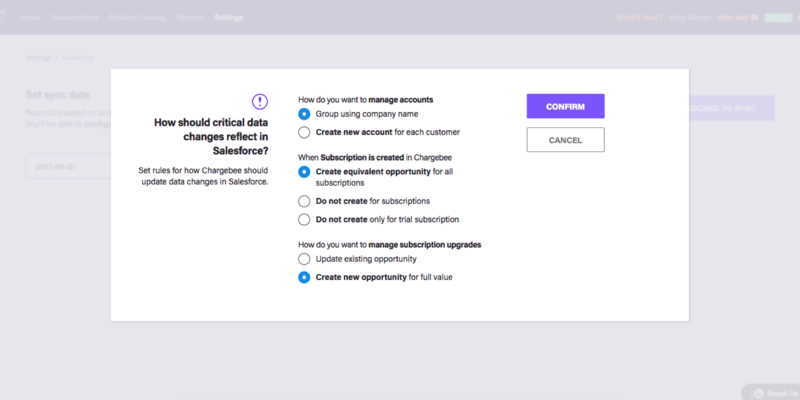 While Salesforce's CRM simplifies managing your sales pipeline, Chargebee's underlying billing engine is built to take charge of your subscription scenarios and pricing models. The seamless integration thus gives you the complete flexibility to handle all your business needs related to sales and billing. Chargebee syncs all your customer data including plans, subscriptions, coupons, pricing etc., with Salesforce. Salesforce is a cloud-based customer relationship management (CRM) software solution that lets you keep track of the leads generated, deals closed, and new customers acquired by your business. It’s that simple. 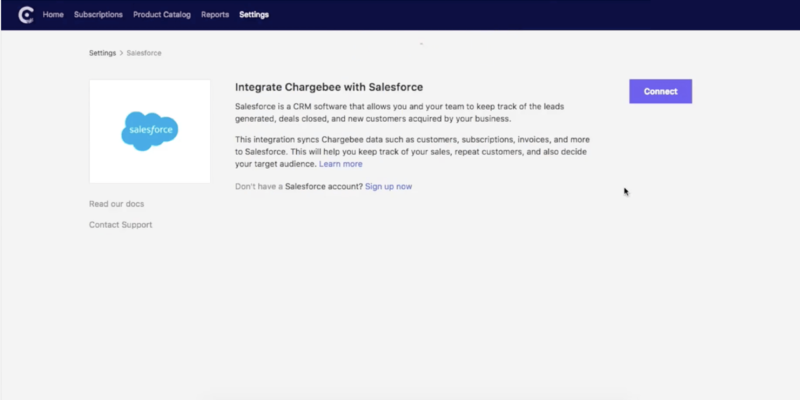 Connect to the Salesforce app, install the Chargebee plugin, test the sync, set up your preferences, and that is it! Chargebee does compatibility checks to validate if prerequisites are met, including customer data, multi currency support, custom fields, and field accessibility. No messy customer records, no data ambiguity, no confusion. 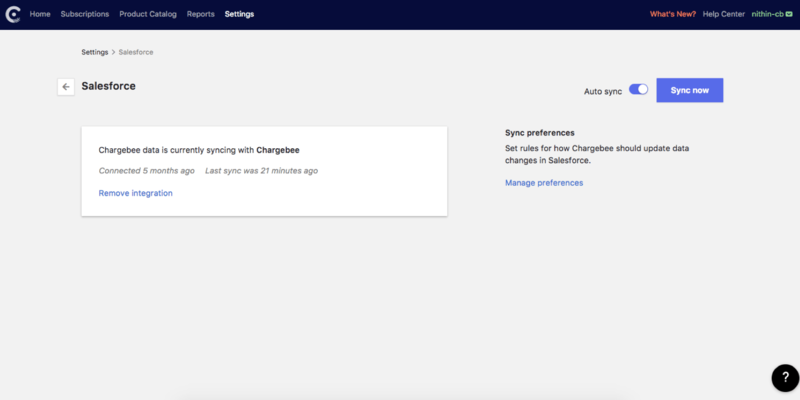 Synchronize data between Chargebee and Salesforce, with the auto-sync option, which will sync data every 30 minutes. You can also sync on demand, if you need Chargebee data reflected in Salesforce immediately. 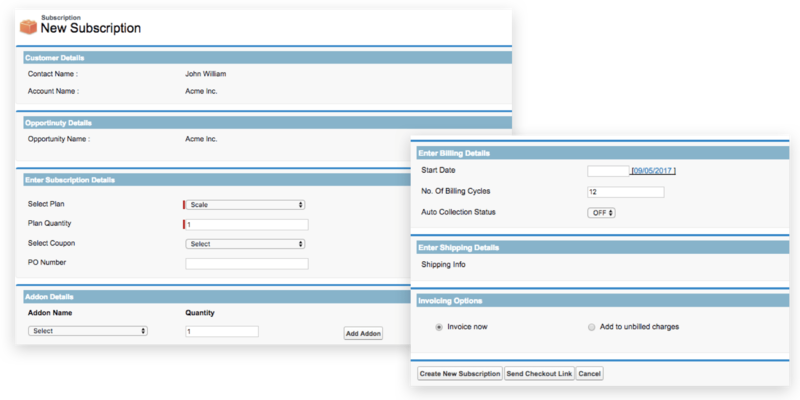 Controlling the entire subscription lifecycle of your customers has never been easier. Be it on-boarding new customers, managing their subscriptions or even handling renewals, Chargebee's integration with Salesforce lets you do all, thus saving you lots of time and manual effort. You can follow up on leads, convert them into opportunities that can be linked with products in Chargebee, and create subscription within Salesforce. Configure your own rules to ensure critical data changes are reflected in Salesforce. You can define what happens in Salesforce when an event occurs in Chargebee, including when you create a customer, when a subscription is created or upgraded, or when a trial customer upgrades as a active user. You are your own master with this integration. 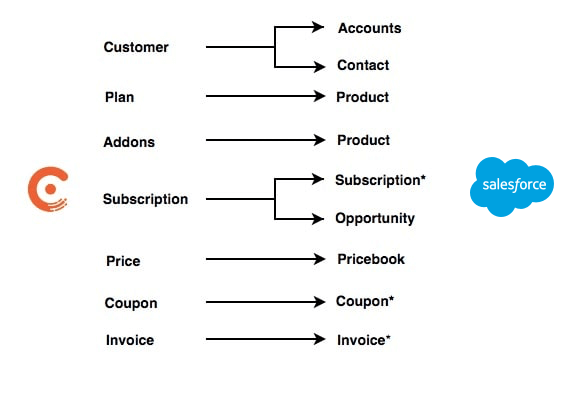 Visit Salesforce to learn more about setting up this integration. What pricing plan does this integration fall under? What happens when two or more customers have the same ID? Which Salesforce edition is the integration supported? If two or more customers have the same email ID, it will be captured as a Sync Error and the sync will not go through. Removing the duplicate values will let you proceed further with the sync. The integration fully supports Salesforce Lightning as well as Classic UI frameworks.